Try hard to think of a recipe that warms the home and body like Chicken and Vegetable Noodle Soup. It is impossible right? In the recipe share, today discover a few vegetables you can grow easily in almost any home garden. Take advantage of the printable recipe and add this to your home favorites to prepare this season. I have also updated this favorite of mine using a pressure cooker that cuts the prep time in 1/2. Below is a favorite of mine to prepare on most any day but especially when the temperature drops outdoors. Look at the yummy chunks of celery in carrots grown in my home garden. It’s especially relevant to note that you can adjust the salt, as a result, it is low sodium. 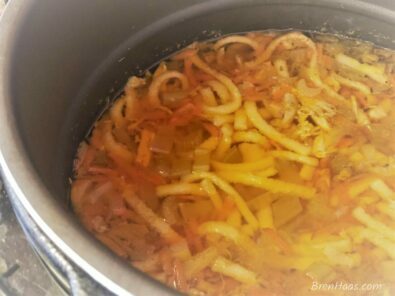 If you add the vegetable stock for flavoring as noted in the video for this post be sure to check the sodium count. Please note I am using an electric pressure cooker to prepare this soup. If you do not have one you need to … use my Amazon affiliate link to get yours today! See notes below the recipe if you are using a stove top. Plug in the XL power pressure cooker. Select meat setting to heat up the pot. Once pot is to temperature add the ghee. Gently stir in seasonings after adding the shredded chicken. Last to go in is the egg noodles. Follow manufacturers directions when closing the lid to the pressure cooker. Let the pressure cooker release on its own. This usually takes about 15-20 minutes. IF you are in a hurry you can manually release pressure by following the manufacturers directions. ENJOY with fresh parsley cut on top of soup. Note: This recipe was from my original post in 2012 using a stove top. I edited this post because using the pressure cooker is the BEST! Welcome to my winter kitchen. I hope you will watch the video featured below. If you like it feel free to embed it on your website or blog. Be sure to follow me on YouTube at @brenhaas. 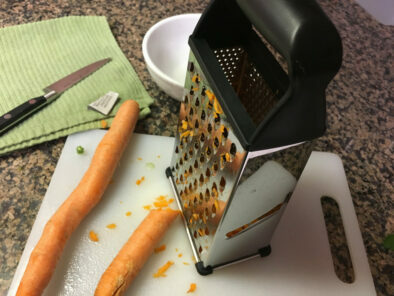 See… I told you it was super easy to make! 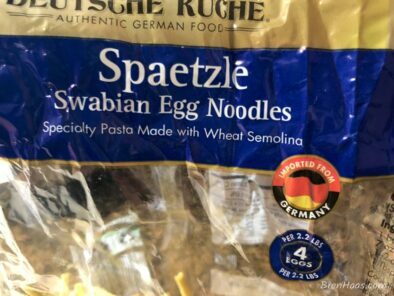 Originally I found the product at Aldi but have seen it at Walmart locally for a great price. If you are a fan of Amazon I will share my affiliate link to the product. I’d appreciate if you bought it from Amazon because I make a small percentage of the sale. Looking at the reviews on Amazon I see many do not know how to use the product. 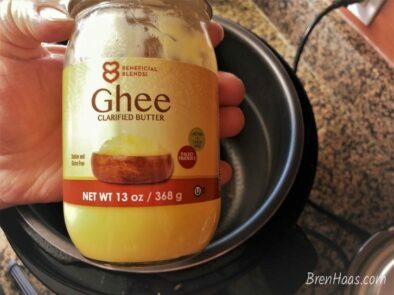 I’ll be heading over to do my 5-star ⭐ ⭐ ⭐ ⭐ ⭐review because I LOVE IT and highly recommend the Beneficial Blends Ghee | clarified butter. I’ve been told by many people that they struggle with growing celery in their home garden. Over the years I’ve started my celery from start plants purchased at the local garden center in early spring. The celery plant seem to most of all enjoy cooler temperatures well, in fact, they grow best in cool and moist soil in my raised garden bed. As a result of our cooler temperatures in NW Ohio and using starter plants I think my celery does well. Because I plant the celery in the raised bed that will get late afternoon shade when summer arrives I think the harvest does well. I’ve created this graphic just for you to share on Pinterest. Let me know what you think of the recipe by commenting on my post and tagging me @brenhaas on Pinterest. See you on my Pinterest blogging friends board once you tag me! Below are a few of my favorite INSTANT meal recipes using the power pressure XL. 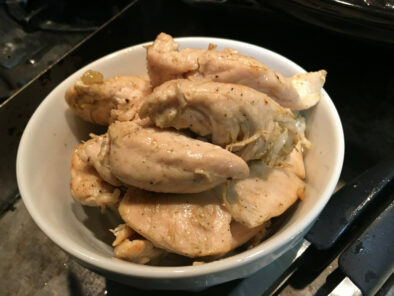 This is a yummy chicken recipe that is easy to make and grow in your garden. 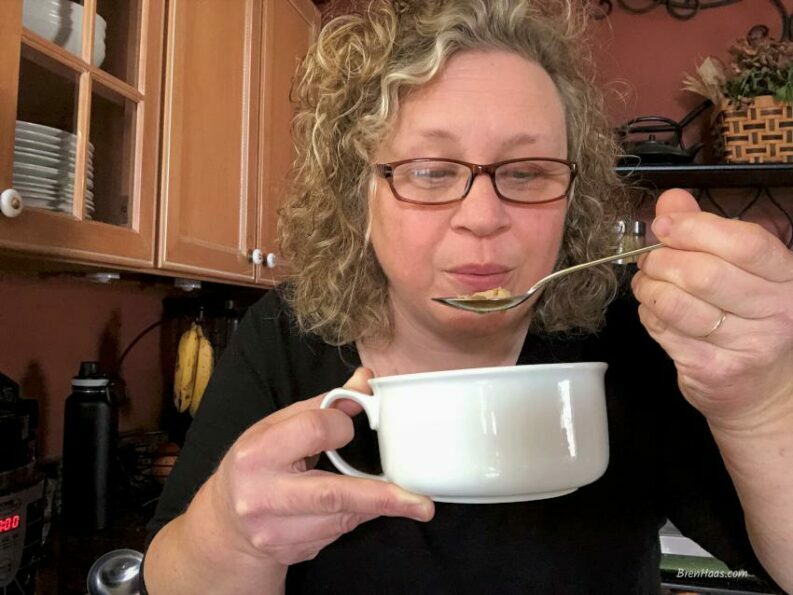 Feel free to use your favorite herbs to season spring veggies like peas and carrots that can be prepared in this soup. Furthermore, I’d like to invite you to stop by and tell me what you think of this recipe. Finally, I hope you found this recipe easy enough to make as soon as possible for your family.